Riding on its research being cited by the world’s scholars, the University of the Philippines made a big jump in the Times Higher Education (THE) Asia University Rankings or the THE ranking of the top 359 universities of the region. The Philippine national university leaped from the 201st-250th ranked group in 2017 to the top 200, placing 156th, in 2018. THE released the results of its 2018 Asia rankings on February 7, 2018. 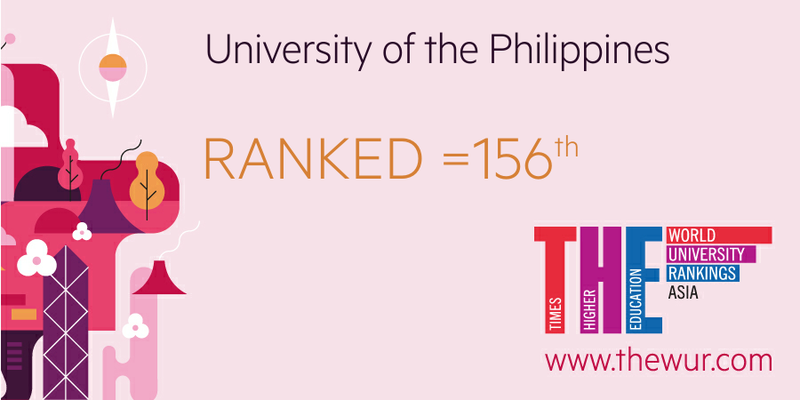 UP is the only Philippine university to figure in the THE rankings, which is currently led by the National University of Singapore. At the same time, in the THE World University Rankings or the THE ranking of the top 1,000 universities in the world, UP moved in overall ranking from the 801st-1,000th ranked universities up to the 601st-800th ranked universities. 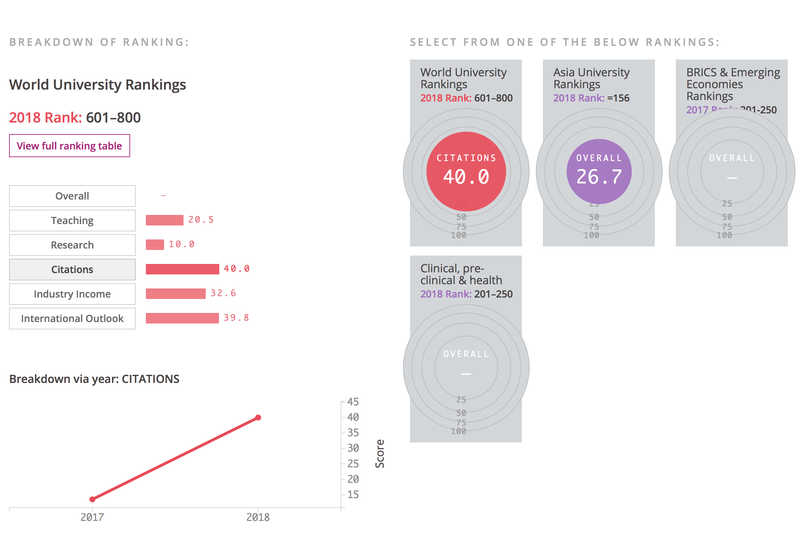 In the areas of clinical, pre-clinical and health, UP ranks higher, falling under the 201-250 ranked group. UP is one of the top 3 Asian universities that moved the most in terms of citations of UP’s published research works by scholars from different parts of the world according to UP Vice President for Academic Affairs Cynthia Rose Bautista. According to THE data, UP’s citations score rose from 13.5 in 2017 to 40 in 2018. The citations score is a measure of the research influence of the university. THE tries to capture the average number of times a university’s published work is cited by scholars globally, using bibliometric data from Elsevier over five years. The citations score comprises 30 percent of the overall score, alongside teaching (25 percent), research (30 percent), international outlook (7.5 percent), and industry income (7.5 percent). From 2017, UP’s teaching score rose slightly from 23 to 23.4; and research, from 10.6 to 11.5.; although its international outlook and industry income scores fell several points. Bautista cited information personally shared by representatives of Elsevier to the university a week ago, revealing that papers from UP are cited 14 percent more frequently than the world average. In medicine, they are cited 336 percent more frequently, according to the same source.